What do we mean when we talk about tensioned stone? Tensioning means to make taut, tight, tense. But how can you tighten a stone? Well, what is actually tightened is a cable running through the stone. This cable, which is stretched and becomes some centimetres longer from the tensioning, will tend to return to its normal length, becoming shorter. But if each end of the cable is attached to a metal piece that impedes this movement, the stone will be compressed between the two metal ends that are trying to come together. So, actually, when we talk about tensioned stone we mean a stone compressed by tensioned cables. 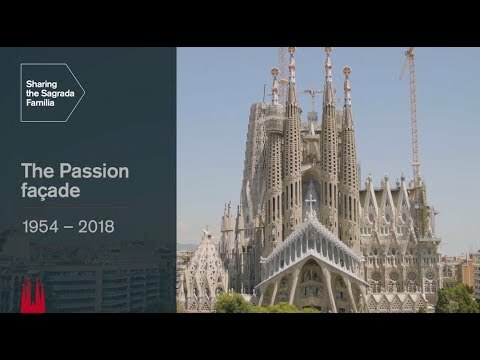 The new technology used to build the central towers at the Sagrada Família has led us to use new terms, taken from others commonly used in the construction world. So, the terms pre-tensioned and post-tensioned already existed, referring to different types of technology used to reinforce concrete with steel rebar, meaning bars that, when tensioned, transfer compression forces to the concrete. Concrete is poured on site in a semi-liquid state, which means it requires a form to hold it in place while it hardens. This process is called setting. So, in the terms pre-tensioned and post-tensioned, the prefixes pre- and post- refer to when the steel rebar is tensioned with regard to the setting of the concrete, before or after it begins to harden. With pre-tensioned concrete, very common in rafters for homes and small buildings, the cables are put inside the mould for the beam, as the picture on the left shows, and tensioned before pouring in the concrete. The two ends are held tight until the concrete hardens. At that point, the cable will want to return to its normal position and length and this will put compression forces from static friction on the concrete along the whole contact surface. The result is a stronger piece and, if these cables are on the bottom side, the beam will curve up a bit, as you can see in the central picture, taking on what is called a camber. When this slightly arched beam is put in place, holding up the expected loads, it will be stronger than if it were totally straight, as any sagging will first cause it to become straight before sagging downward. In post-tensioned concrete, usually used in much larger works like motorway overpasses, the technique is quite different. 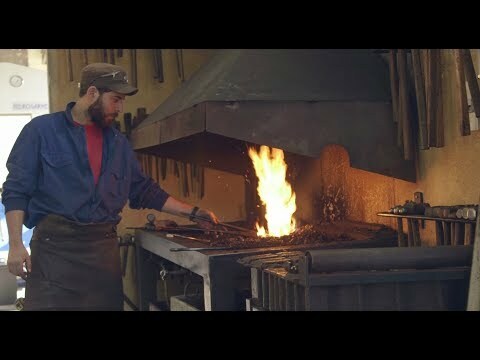 The steel isn’t put directly into the mould, but into a sort of case in a position that follows the internal lines of the forces: higher on the ends where the piece sits and lower in the centre, where a camber is needed, as you can see in the third picture. 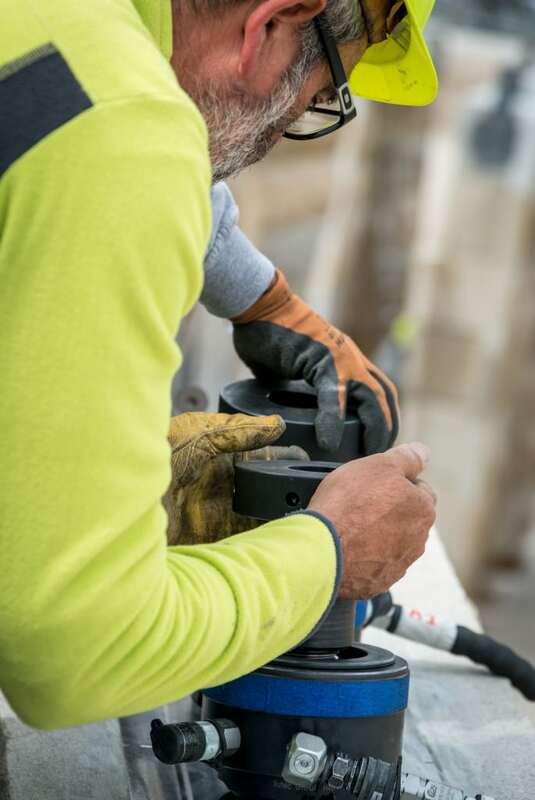 When the concrete has hardened, the cable is run through these cases and then tensioned, holding it in place on either side with metal stoppers, or tensing anchors. 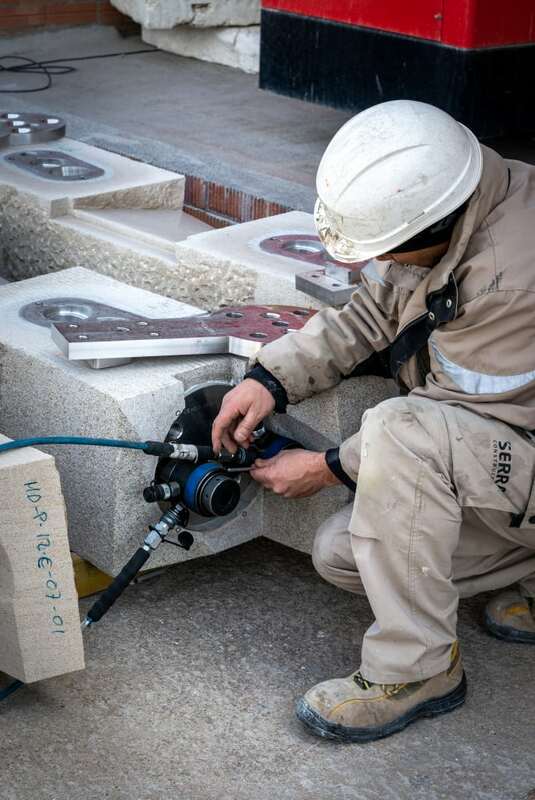 So, when we talk about the stone with tensioned cables used at the Sagrada Família we use the term “tensioned stone”, and not the more well-known adjectives “pre-tensioned” or “post-tensioned”, as there is no hardening process with the stone. The image of moving a row of books is a great way to illustrate how the tensioned-stone panels designed for the central towers of the Basilica work. If we press hard enough on either end, we can move all the books at once and, even though they aren’t attached in any way, they won’t fall and we can move them as a single block. In this case, the force of gravity, vertical, is what is working to make the books fall and the force we are creating, horizontal, is what resists this fall. If we turn this image 90°, the comparison to the panels is even clearer. The force of the wind, horizontal, is what is trying to deform the panels and the force of the tendons, vertical, is what resists this. Moreover, being able to move a whole panel all at once, as a single block, has many advantages. First, it makes it easier to pre-assemble the pieces, which can be done at ground level, which is always safer than up high. Second, it makes it easier to review the work and to test the waterproofing of the wooden joins, as they are more accessible. Third, it makes it easier to schedule tasks, as the finished panels can be stored before using, standardising the pace of works and production. 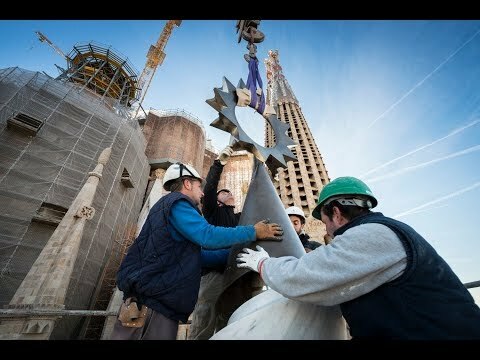 Last but not least, the panels make the progress of the work on the Sagrada Família much more noticeable. 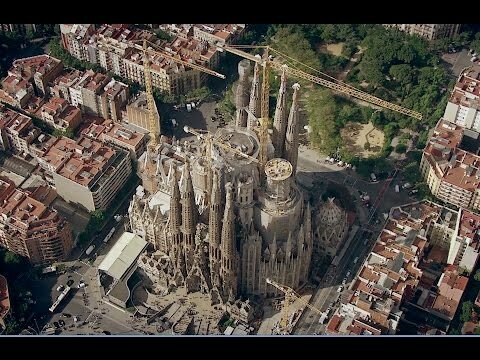 The fact that everything can be prepared in advance means that when the pieces are put in place at the temple people see everything advancing very quickly, at breakneck speed, which shows that it is possible to finish by 2026.